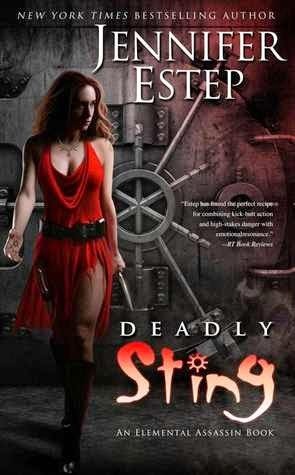 Gin Blanco returns in book eight of the Elemental Assassin series, Deadly Sting. The book starts off with Finn, Gin's foster brother taking her shopping for a fancy dress. He's asked her to go to a gala with him that is showing Mab Monroe's possessions. Everyone that is anyone will be there, and Finn can't resist rubbing elbows with the rich. Things quickly escalate when someone attempts to assassinate Gin, and hold everyone at the gala hostage. With each second passing by, Gin has to figure out how to save her friends and all the other innocent people, and still manage to take down the bad guys. I enjoyed seeing Gin puzzling out everything on her own, since her friends were in the crowd being held hostage. It tossed a bit of difference from the other books in the series, since she generally figures everything out with her friend's aid. The villain in Deadly Sting didn't really impress me, and I'll be honest, this wasn't my favorite book in the series. But it wasn't a disappointment, it added a bit more to the overall series plot. The book leaves a big question in the air that I cannot wait to see what happens next. It's not really a cliffhanger, but it definitely left me intrigued and making grabby hands for the next book. I recommend this series if you're a fan of Urban Fantasy with a female lead that isn't afraid to get her hands dirty. Ahhh! I still haven't read any of Estep's books ;-; but I do like thaty ou said that this book is tossed up differently from the other books. i think that keeps the series fresh and makes you want to keep reading. And that cover! I like! Sigh. I need to get on these asap. Great review, girly! btw I'm loving the new look! The background looks great! Thanks!! I think you'd enjoy the series. You like bada** b*tches. I love this series, but I haven't read the most recent one. I need to get to it soon. It is a great series on audio. Great review. Thanks Melanie! I still have a few to catch up on, I've really been enjoying the series. This was one of my least favourite installments in this series, on account of the story taking place in only one location, and as you mentioned, the dynamics were a bit different. Still, I also gave it four stars because Jennifer Estep and Gin Blanco RULE! Wonderful review! YES! As I was reading, I was like why haven't they changed locations yet. WHY? !